"I say, is fiddling difficult?" 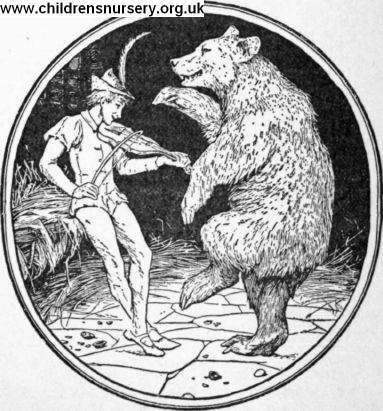 with the right you draw the bow across them, so—then it goes as easily as possible, up and down, tra, la la la la-----"
"Oh," cried the bear, "I do wish I could play like that, then I could dance whenever the fancy took me. What do you think? Would you give me some lessons?" "With all my heart," said the tailor, "if you are sharp about it. But just let me look at your paws. Dear me, your nails are terribly long; I must really cut them first." Then he fetched a pair of stocks, and the bear laid his paws on them and the tailor screwed them up tight.